The use of chemical fertilizers & scientific management of plant nutrition has resulted into yield improvement. However to boost up immunity of crops it is essential to use amino acids. 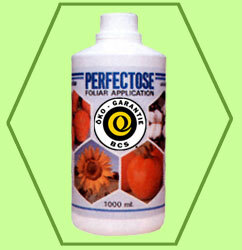 Perfectose has amino acids with mol. wt. less than 400gms per mole & penetrate through stoma of plants into the physiochemical & biochemical system of the plant. & helps to improve yield. 2 Reduces flower & fruit drop. 3 Improves rate of absorption of fertilizers. 5 Improves yield & keeping quality of fruits, vegetables & other perenial crops.